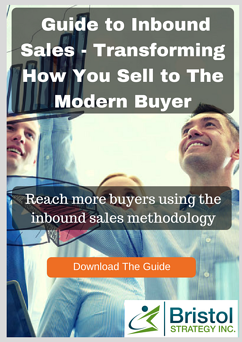 Guide to Inbound Sales - Transforming the way you sell to the modern customer. There is no question that the Internet has fundamentally and irrevocably changed how we do business. Prospects spend 2/3 of the buying process performing research online. They know a lot before they engage with a sales person. If you can be part of their research by offering valuable information when they are searching for information, then you may be included as a possible solution. Businesses who do not apply Inbound Sales best practices my be left out completely and not even know they are losing sales to those who do. With oceans of data for buyers to wallow in – everything from product and service information, to price comparisons and consumer reviews – the buyer is clearly in control. Using the Inbound Sales methods enables the sales rep to gain back some of the access they lost early in the sales cycle. Learn about the Identify, Connect, Explore, and Advise stages of sales. It is hard to change, especially if you have been selling for a long time. Understand that this approach is not a wholesale change because it affects the process of connecting with prospects and establishing trust - once you connect, all of your sales skills still apply so long as you continue to deliver value with each engagement. Complete the form to the right to download this detailed guide.